Move over, peanut butter and jelly! 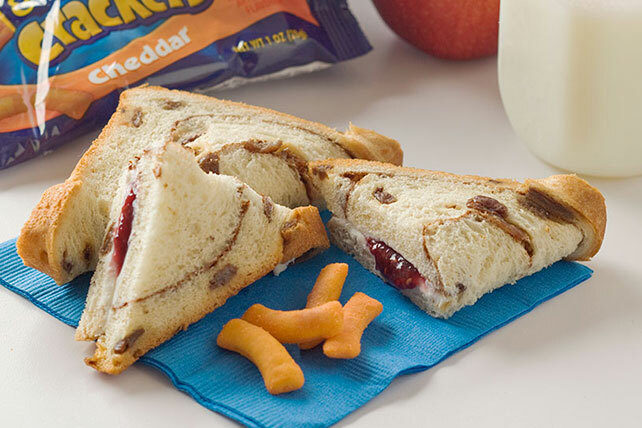 Raspberry preserves and cream cheese star in these cinnamon-raisin bread fold-over sandwiches. Spread centers of bread slices with reduced-fat cream cheese, then preserves. Fold diagonally in half; pinch edges together to seal. For variety, prepare using your favorite flavor of preserves. Serve with 1 pack (1 oz.) KRAFT Macaroni & Cheese Crackers, small red apple, and 1 carton (8 oz.) fat-free milk.